The American Tri-Five Association official international membership. This Membership is for International Orders Only! You love Tri-Fives, chances are you have one in the garage. Why not become a member of the largest Tri-Five group ever! Your membership includes an official card, decal and subscription to The American Tri-Five magazine. 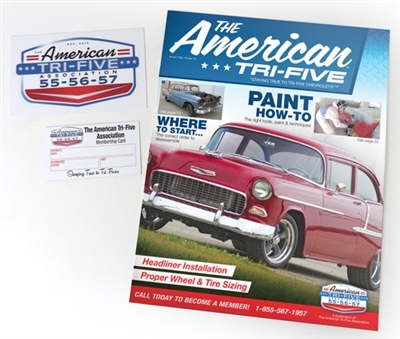 The American Tri-Five magazine has nine issues a year and features how-to tech articles, members only featured Tri-Fives, historical data, event coverage - with no ads! This full color publication is a great resource that will keep you up-to-date with the latest Tri-Five information and events. Members are also eligible for exclusive member only discounts to retailers like Danchuk, Woody's Hot Rodz and discounted rates on classic car insurance from Heacock Classic Insurance. You can also get a discounted entry to The Danchuk Tri-Five Nationals and much more! All memberships received thru December 31, 2015 will start January 1, 2016 and renew January 1, 2017.
INTERNATIONAL memberships require an additional shipping charge. That charge is already included in this price. If your country is not listed upon checkout, you must call us to become a member @ 1-855-567-1957.